\ The Therm-A-Sleep Adjustable Pillow System features removable comfort fill for personalized head and neck support, and a botanic Tencel lyocell pillow cover that keeps your pillow clean, dry and dust mite-free so you sleep soundly. \ 60 oz. of fine microfiber fill provides sturdy loft and compression, and is easily removable for adjustable comfort tailored to your pillow height and firmness preferences. 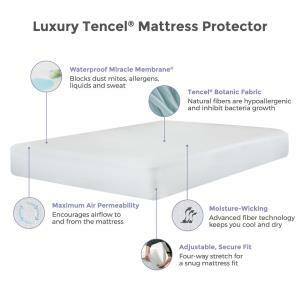 \ 100% Tencel pillow cover has natural origins with soft, smooth fibers for sensitive skin, and is hypoallergenic, moisture-wicking, and inhibits bacteria growth. 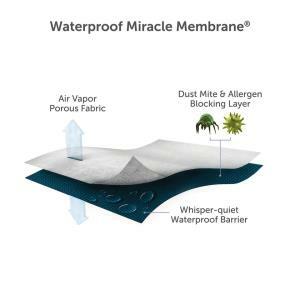 \ Miracle Membrane barrier promotes a healthy sleep environment by protecting you from dust mites and other allergens that may lurk in your pillow. \ Whisper-quiet waterproof pillow cover extends the life of the pillow by blocking accidents, incontinence, perspiration, spills and stains, yet is air permeable to keep you dry and cool. \ Bed bug bite-proof, entry-proof and escape-proof with patented BugLock Secure Seal three-sided zipper. \ Cooling Breathe-A-Vent mesh fabric panel promotes fresh air circulation through the pillow. \ Good Housekeeping quality tested and approved. \ FDA Class 1 Medical Device. \ Safety tested and certified by the Standard 100 by Oeko-Tex. The Therm-A-Sleep Adjustable Pillow Queen Therm-A-Sleep Adjustable Pillow by Protect-a-Bed at Darvin Furniture in the Orland Park, Chicago, IL area. Product availability may vary. Contact us for the most current availability on this product. From extra-large and firm to a low profile and squishy, the adjustable pillow lets you tailor the pillow's fill to suit your preferences. The Therm-A-Sleep Adjustable Pillow collection is a great option if you are looking for Mattresses in the Orland Park, Chicago, IL area.